It’s here! The best way to access WFYI, NPR and PBS programs any day, anytime from anywhere in the world is the new, free WFYI mobile app. Available for all iOS and Android devices, the WFYI mobile app allows you to stay connected to the content you love and adjusts to whatever screen size you have. You can also view WFYI and PBS on-demand video content, including “members only” shows available through Passport, and live stream PBS KIDS programs 24/7. With advanced audio and video streaming technology, the new WFYI mobile app is the most convenient way for you to stay informed and entertained with the trusted brands of WFYI, PBS and NPR wherever you go. At WFYI, we believe public media can empower and connect people through thoughtful journalism, inspiring stories and lifelong learning. We couldn’t provide the information and community dialogue we produce without your support, so thanks for watching, listening and contributing. We hope you enjoy the WFYI app! 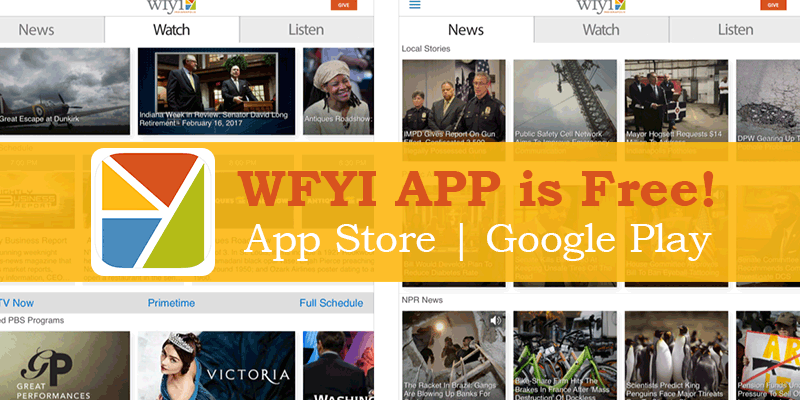 Download the WFYI mobile app by searching “WFYI” in the App Store or Google Play or simply click on the links below.